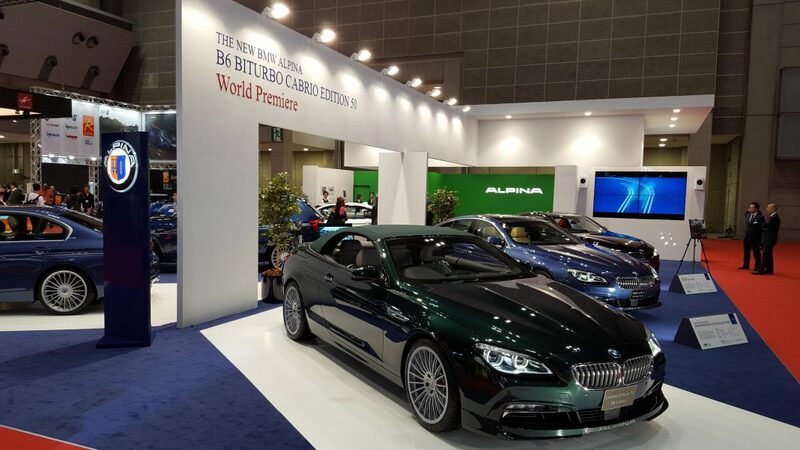 Alpina has delivered at the ongoing Tokyo Motor Show 2015 by putting on display some of its most important and popular models. For starters, the BMW Alpina B3 Bi-Turbo sedan and BMW Alpina B6 xDrive Gran Coupe are both celebrating their Asian debuts at the show. The Alpina B3 Bi-Turbo features an upgraded 3.0-litre turbocharged engine that delivers 410 hp between 5500 rpm and 7000 rpm. The Bi-Turbo powerhouse will be mated to a new ZF eight-speed automatic gearbox. As for the B6, based around the BMW 6-Series, it utilises a twin-turbocharged 4.4-litre V8 engine pumping out 600 hp at 6000 rpm and 590 lb-ft of torque at a low 3500 rpm. Consequently, the car accelerates to 100 km/h in just 3.6 seconds and a top speed of 320 km/h, putting it on par with some supercars. Also on display is the special 2016 Alpina B6 Bi-Turbo Edition 50. Just 50 units are bound for the production line and it is powered by the same 600 hp engine as the standard B6. However, it is installed with an improved limited-slip differential as well as a unique set of wheels and distinct interior touches commemorating the 50th anniversary of Alpina.